Can the magic last? Utah’s 12-0 women’s basketball team is reaching for the top. (Francisco Kjolseth | The Salt Lake Tribune) Dru Gylten of the Utah women's basketball team practices at the Jon Huntsman Center on Wed. Jan. 2, 2019, as they prepare for their next game on Friday. The team guided by coach Lynne Roberts has them rolling 12-0, in one of the best starts in program history. (Francisco Kjolseth | The Salt Lake Tribune) Erika Bean of the Utah women's basketball team practices at the Jon Huntsman Center on Wed. Jan. 2, 2019, as they prepare for their next game on Friday. The team guided by coach Lynne Roberts has them rolling 12-0, in one of the best starts in program history. (Francisco Kjolseth | The Salt Lake Tribune) Utah women's basketball head coach Lynne Roberts talks to her team during practice at the Jon Huntsman Center on Wed. Jan. 2, 2019, as they prepare for their next game on Friday. The team is having one of the best starts in program history at 12-0. (Francisco Kjolseth | The Salt Lake Tribune) The Utah women's basketball team comes together following practice at the Jon Huntsman Center on Wed. Jan. 2, 2019, as they prepare for their next game on Friday. The team is having one of the best starts in program history at 12-0. (Francisco Kjolseth | The Salt Lake Tribune) Utah women's basketball head coach Lynne Roberts, right, runs her team through drills during practice at the Jon Huntsman Center on Wed. Jan. 2, 2019, as they prepare for their next game on Friday. The team is having one of the best starts in program history at 12-0. (Francisco Kjolseth | The Salt Lake Tribune) The Utah women's basketball team stretches out following practice at the Jon Huntsman Center on Wed. Jan. 2, 2019, as they prepare for their next game on Friday. The team guided by coach Lynne Roberts has them rolling 12-0, in one of the best starts in program history. (Francisco Kjolseth | The Salt Lake Tribune) Dru Gylten of the Utah women's basketball team practices at the Jon Huntsman Center on Wed. Jan. 2, 2019, as they prepare for their next game on Friday. The team guided by coach Lynne Roberts has them rolling 12-0, in one of the best starts in program history. (Francisco Kjolseth | The Salt Lake Tribune) Utah women's basketball head coach Lynne Roberts, right, runs her team through drills during practice at the Jon Huntsman Center on Wed. Jan. 2, 2019, as they prepare for their next game on Friday. The team is having one of the best starts in program history at 12-0. (Francisco Kjolseth | The Salt Lake Tribune) Utah women's basketball head coach Lynne Roberts, right, runs her team through drills during practice at the Jon Huntsman Center on Wed. Jan. 2, 2019, as they prepare for their next game on Friday. The team is having one of the best starts in program history at 12-0. (Francisco Kjolseth | The Salt Lake Tribune) Utah women's basketball head coach Lynne Roberts runs her team through drills during practice at the Jon Huntsman Center on Wed. Jan. 2, 2019, as they prepare for their next game on Friday. The team is having one of the best starts in program history at 12-0. 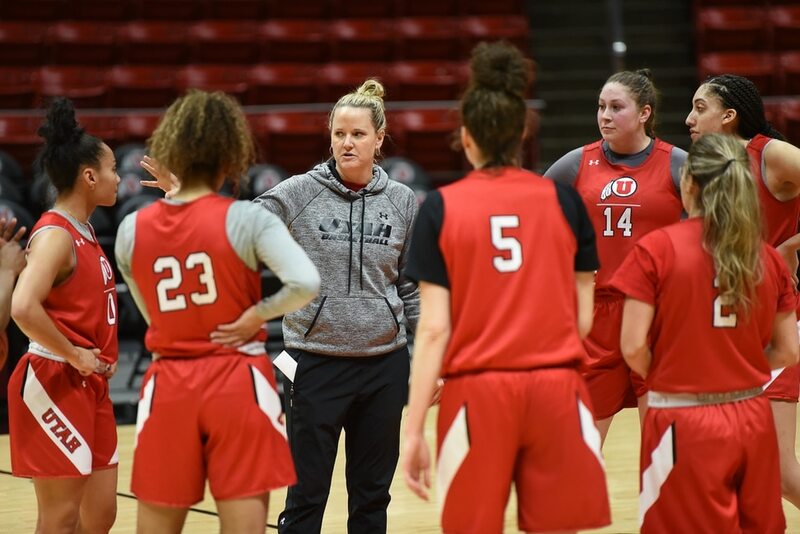 (Francisco Kjolseth | The Salt Lake Tribune) Utah women's basketball head coach Lynne Roberts works with her team as they prepare for their next game while practicing at the Jon Huntsman Center on Wed. Jan. 2, 2019. The team is having one of the best starts in program history. (Francisco Kjolseth | The Salt Lake Tribune) The Utah women's basketball team practices at the Jon Huntsman Center on Wed. Jan. 2, 2019, as they prepare for their next game on Friday. The team guided by coach Lynne Roberts, upper left, has them rolling 12-0, in one of the best starts in program history. (Francisco Kjolseth | The Salt Lake Tribune) Niyah Becker of works out with her team as the Utah women practice at the Jon Huntsman Center on Wed. Jan. 2, 2019, as they prepare for their next game on Friday. The team guided by coach Lynne Roberts has them rolling 12-0, in one of the best starts in program history. (Francisco Kjolseth | The Salt Lake Tribune) Utah women's basketball head coach Lynne Roberts runs her team through drills during practice at the Jon Huntsman Center on Wed. Jan. 2, 2019, as they prepare for their next game on Friday. The team is having one of the best starts in program history at 12-0. (Francisco Kjolseth | The Salt Lake Tribune) Utah women's basketball head coach Lynne Roberts lets the team take a water break as they prepare for their next game at on Wed. Jan. 2, 2019. The team is having one of the best starts in program history. (Francisco Kjolseth | The Salt Lake Tribune) Megan Huff lays one up as the Utah women's basketball team practices at the Jon Huntsman Center on Wed. Jan. 2, 2019, as they prepare for their next game on Friday. The team guided by coach Lynne Roberts has them rolling 12-0, in one of the best starts in program history. (Francisco Kjolseth | The Salt Lake Tribune) Utah women's basketball head coach Lynne Roberts runs her team through drills during practice at the Jon Huntsman Center on Wed. Jan. 2, 2019, as they prepare for their next game on Friday. The team is having one of the best starts in program history at 12-0. (Francisco Kjolseth | The Salt Lake Tribune) Kiana Moore of the Utah women's basketball team practices at the Jon Huntsman Center on Wed. Jan. 2, 2019, as they prepare for their next game on Friday. The team guided by coach Lynne Roberts has them rolling 12-0, in one of the best starts in program history. (Francisco Kjolseth | The Salt Lake Tribune) Dru Gylten, left, and Dre'una Edwards run through drills as the Utah women's basketball team practices at the Jon Huntsman Center on Wed. Jan. 2, 2019, as they prepare for their next game on Friday. The team guided by coach Lynne Roberts has them rolling 12-0, in one of the best starts in program history. (Francisco Kjolseth | The Salt Lake Tribune) Daneesha Provo of the Utah women's basketball team practices at the Jon Huntsman Center on Wed. Jan. 2, 2019, as they prepare for their next game on Friday. The team guided by coach Lynne Roberts has them rolling 12-0, in one of the best starts in program history. Lynne Roberts doesn’t wade in the realm of clichés very often, so when she found herself smack-dab in the middle of a quintessential coaching cliché this week, she immediately caught herself. Yes, she knows it sounds a bit corny that despite her team’s 12-0 start, they just don’t talk about it. 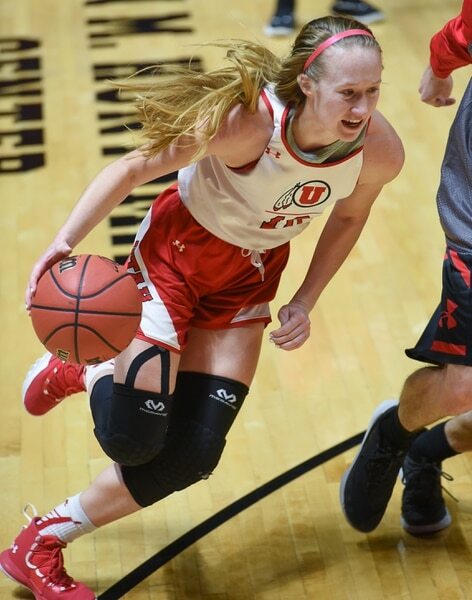 In fact, the Utes deflect the very notion of its existence, because when you’re the lone unbeaten Pac-12 team left and one of just seven teams left in Division I women’s basketball yet to walk off a court bummed out by a loss this season, you have to find a way to maintain an edge. So when asked about the unblemished start — the second best start to a year in program history — Utah’s head coach shook her head when she begrudgingly embraced a stock answer. You don’t have to dive deep into the calendar to see her point. Yes, the Utes are 12-0, but in their Pac-12 home opener Friday against No. 22 Arizona State, they’ll be exactly what Roberts said: the same old underdog. And they will, once again, maintain that role until they put together an impressive conference season and make a dent in the status quo of Oregon, Oregon State, Cal, Stanford, ASU, and so on. So for now, talk of that very big zero doesn’t get you that far. “We’re not trying to think about it. We don’t want any added pressure,” added senior point guard Erika Bean. The Utes are confident and bullish on themselves, and rightfully so. But they’re also realistic. They know that they want their name etched into program history for all the reasons other than having a hot start to another season. After all, it’s been seven years since the Utes have made the NCAA Tournament, their last invite coming in their final year in the Mountain West Conference. So as Roberts noted, they haven’t proven themselves. Not yet. This group believes it has the foundation to change that, however. 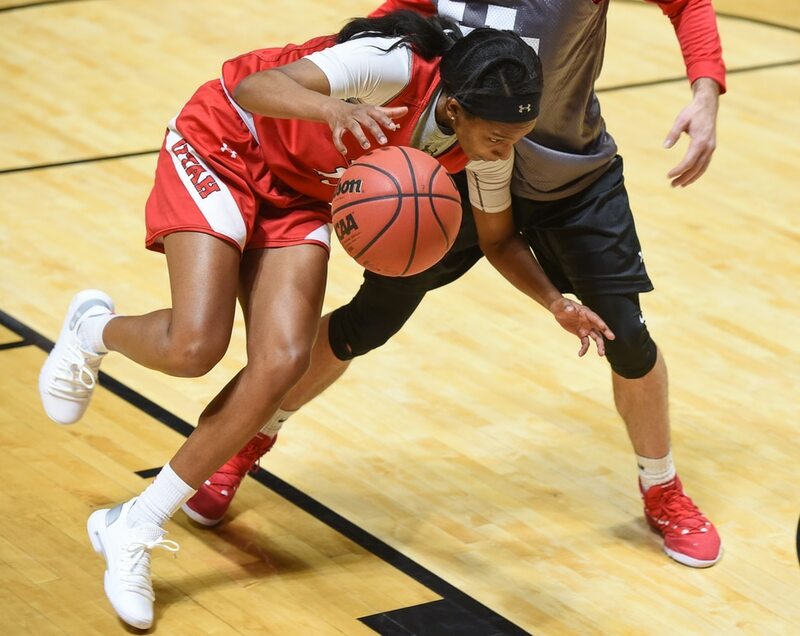 Paced by dynamic senior scorers Huff (19.8 points and 9.3 rebounds per game) and Daneesha Provo (13.5 points per game) and a boatload of freshmen chipping in, Utah stormed through its non conference schedule. In the 2018-19 Pac-12 season-opener at Colorado last weekend, the Utes got a breakout 18-point performance from freshman forward Andrea Torres. Freshman Dre’Una Edwards is also averaging 12.5 points and 8.2 boards per outing. That’s a sign, Roberts explains, that this roster is nearly to where she’s wanted it since taking over in 2015. In the Pac-12, that haymaker could come as soon as Friday night against the visiting Sun Devils. Veterans like Huff, Bean and Provo have done their best to prep this young roster for what’s about to happen: weekly tests against the top teams in college basketball, against future pros who can own a game in an instant. “Everyone’s doing what they need to do, nobody’s taking it easy, nobody’s relaxing because we know how hard the Pac-12 is,” Huff said. When the Utes were given an off day on the first day of 2019, the players didn’t lounge. They met up at the gym and got some shots up. This year’s group is embracing what Huff and Bean call “the little things,” and are zeroed in on not allowing this group to feel any tinge of complacency. In year’s past, Huff said, she’s seen her teams get a little loose after terrific starts, which led to eventual tough loses in conference play. Bean is the lone Ute who has been in Salt Lake City for the duration of the Roberts era. She’s felt the elation of all 21 Pac-12 wins and the disappointments of all 33 Pac-12 losses. Her perspective on this year’s team is obviously unique. She’s seen the ongoing transformation up close. And before the still-unbeaten Utes were able to leave the Huntsman Center, Roberts chose Provo to end it the way they do every day: a player chosen at random needing to sink two free throws. Provo drained the first, only to see the second rim out. The Utes sprinted the length of the court and back. Provo stepped back to the stripe, drained each free throw. And that was that. Roberts still vows nothing was different about prepping for this year. No lavish team activities or trust-building exercises. Tip-off » Friday, 7 p.m. Historic start to the year » After starting the season 12-0, the Utes are riding their second-best start to a year ever in program history. Only Elaine Elliott’s 1997 squad that started 16-0 had a hotter start to a season. Utah won its Pac-12 season-opener 76-61 last weekend. The Utes are the lone unbeaten Pac-12 team left and one of just seven unbeatens left in college basketball.